We were able to provide a successful event for Dell while staying within their budget. By creating an intimate private party that enhanced the powerhouse’s branding, our client and their guests could focus on developing deeper relationships. Our goal was to leave a lasting impression on Dell’s executives, employees and guests. We delighted our client with a live band, impactful branding presentations, delicious food and a premium open bar. Working with a large company such as Dell required multiple departments and approval processes for statements of work. We wanted to start planning this event well in advance to give the company time to make the most informed decisions and approve our proposals. Ultimately we were able to organize a stress-free event due to our meticulous planning and execution. It was important our client and their guests walked away with a Las Vegas experience they wouldn’t forget. 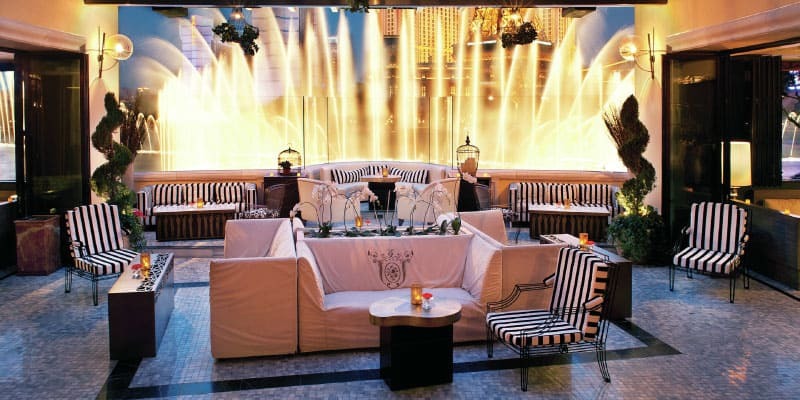 We knew Hyde Bellagio with its incredible view of the Bellagio Fountains would do just that. The ambiance and layout of the venue proved to be efficient for mingling and networking between our client’s guests, which they were happy to note in our follow-up conversations. Let the venue speak for itself. Utilizing the ambiance and layout of a space, the perfect private party can promote organic connections among the group. Here’s how we crafted a memorable event for Dell. Working with the prestigious company Dell was an absolute pleasure. Due to their vast experience in throwing events all over the world, they knew exactly what type of experience they wanted to give to their attendees making our job a breeze. They called upon us for help to find the best venue to host their event. We are a vetted Las Vegas partner that they could trust to organize the experience for them. With a need for managing and facilitating an after-awards dinner for their employees and guests, we got to work on figuring out how to maximize their value based on their budget and goals. 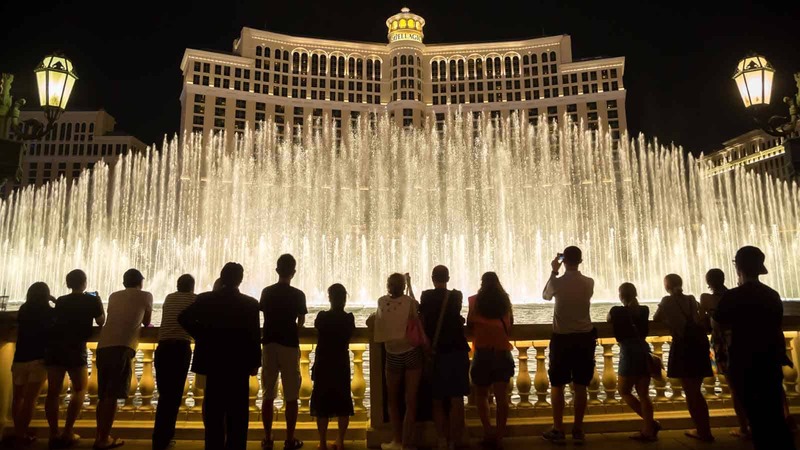 Hyde Bellagio’s view of the world-famous fountains. We settled on Hyde Bellagio for its intimate ambiance and reputation as a classy lounge and upscale nightclub. Thanks to our relationships with decision-makers at the property, we were able to secure a full venue buyout for our client at a great rate. With the space secured, we started working on the entertainment, food and drink options. We opted for a live band on stage rather than a DJ to best suit the client’s music preferences. We also managed the stage and A/V setup. To strengthen the feel of a takeover, we setup LED boards across the venue with branding and marketing collateral from Dell. Attendees would be made sure that Dell reigned supreme. Hyde Bellagio during a nightclub party. We negotiated with the venue on a fair rate for food choices to keep our client’s guests satiated throughout the night, and made sure that the three-hour open bar we managed was stocked with drinks our client preferred. Ultimately, the client was extremely satisfied with our work and was confident that the evening was a complete success. We look forward to working with Dell again in the near future. We were commissioned by Dell to create a special event for employees and their guests. The event called for a full venue buyout of Hyde Bellagio, an upscale and stylish nightclub overlooking the Bellagio Fountains. The event included a live band, LED boards for marketing and branding, food options and an open bar. The client utilized our services from start-to-finish. To add an extra personal touch for the group, we provided each attendee with a swag bag that included aspirin, snacks, water and Dell marketing materials. The swag bag was a hit after a long night of mingling and networking. Stupak was responsible for working with Dell’s marketing and special events department to create this amazing event. We were solely responsible for reserving the venue and coordinating a full buyout of the space. We managed and facilitated the live band, setup the LED boards and the stage, tested the A/V equipment and chose the food options for our client. We wanted to maximize our client’s value, so we ensured that everything would be taken care of. This allowed the special events team to focus on taking care of their guests and ensuring everyone was having fun. Find out how we can put solutions like these to work for your business.